Tempo is increasingly becoming an important aspect of coaches’ offensive philosophy, and it is vital for coaches to learn how to maximize this tool. This article discusses how, when and why coaches should use tempo, as well as how coaches can simulate tempo when they can’t go fast. “One word calls” are plays where the entire play is communicated with one word in order to speed up communication and run the play before the defense is ready. Here Bill O’Brien talks about his use of one word calls during his time with the Patriots. Scott Frost also talks about why he uses one-word calls during his clinic in Orlando. One thing to note is that one-word calls are not limited to pure no-huddle teams. Pro-style coaches such as Matt Canada and Josh McDaniels have had great success with no-huddle one word calls. After a big play: Defenses can have a tough time getting set after a big play. Goal line: Defenses normally have a numbers advantage in the run game on the goal line. Running tempo, especially when paired with unbalanced sets, can get defenses out their gaps. RPOs: Against tempo, defenses can have trouble lining up correctly to formations which can give the offense a numbers advantage in the RPO game. Run game: Defenses often get out of their gaps against tempo which can lead to big plays in the run game. When running tempo, it is important to be prepared to block undefined/moving fronts in the run game, this may mean “track blocking. Unbalanced: Running the ball from unbalanced/tackle over formations, off tempo can force defenses to quickly adjust their front. Deep shots: Tempo can often cause blown coverages in the secondary which can be exposed by throwing shots vertically. As I’ve talked about previously, Baylor made a living off doing this. Repeat: Many teams have a call to repeat the play they just ran. If the defense can’t defend a certain formation or play properly, using tempo doesn’t give them a change to adjust or correct. Ole Miss had a scoring drive in which they ran the same play 5 times in a row off tempo. Often times these teams will also have a call to repeat the play but flip the formation. Go-Go-Go: Baylor had a series in which they ran a vertical choice route to their sideline off tempo three times in a row, each time subbing in a new receiver. The idea being that by the third play, they’d have a fresh receiver running a vertical against a defensive back who just ran two 40-yard sprints. Below is an example where Baylor ran outside choice to their sideline with No. 9, KD Cannon. On the next play, they quickly subbed in No. 8, Ishmael Zamora, and off tempo they ran the exact same play for a touchdown. Before the second play, the corner is fatigued and barely got set before the snap. Had they not scored on the second play, I imagine Baylor would have subbed KD Cannon back in to run a vertical off tempo for a third time. Check with me: Many no-huddle teams will have a call in which there is no play. The quarterback goes to the line and calls a cadence. If the defense jumps offsides, the offense takes advantage of the free play by throwing deep. If they don’t jump, the offense checks the sideline and runs the play. This can be called either because the defense is jumping the snap, or because the coach wants to see the defensive alignment before he calls the play. 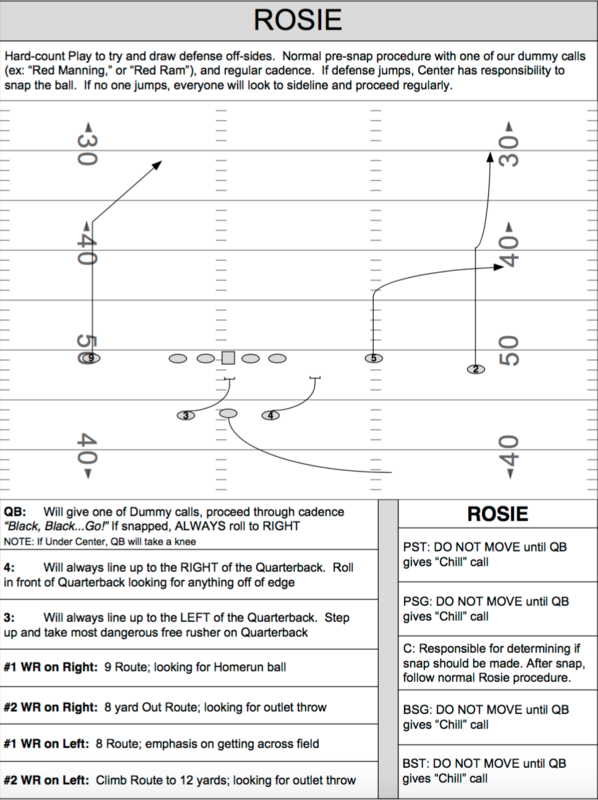 Here it is described as “ROSIE” in Auburn&apos;s playbook. Fake Check with me: Scott Frost discussed running a fake check-with-me tempo in which they would call a fake snap count, start to look to the sideline like it’s check with me, and then snap the ball quickly. Often times when running check-with-me tempo, the defense also checks their play call, so running a fake check-with-me may allow the offense to snap the ball while the defense is looking to the sideline, checking into a new play. Shifts-motions: In the 2017 season, when tempo was unavailable (like on the first play of a series or after a time-out) Scott Frost’s UCF teams either ran a shift or motion before almost every play. I think the idea behind it is that when tempo is unavailable, shifts/motions are another way to stress the defense pre-snap by condensing the amount of time the defense has before the snap to recognize formation, make their calls, and know their assignment. Matt Canada runs one shift that I find particularly intriguing in which he tells players to “line up wherever they want” and then shift into the called formation and run a play. While on Gruden’s show, quarterback Nathan Peterman talks about this shift. Sugar huddle: Much like Scott Frost used shifts, Gus Malzahn’s Auburn teams would use a sugar huddle or “fire alarm” to simulate tempo when tempo is unavailable. Like shifts and tempo, running plays from a sugar huddle can cause confusion because the defense only has a few seconds from when they recognize the formation to when the ball is snapped. Here is a description of “Fire Alarms” from Auburn’s Playbook . Below is an example of Auburn using a sugar huddle on the first play of the Iron bowl, and causing defensive confusion.